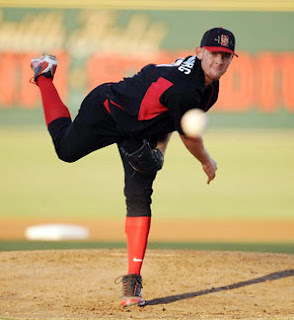 San Diego State phenom Stephen Strasburg has signed with the Washington Nationals. The Learner's were able to to ink the 6-foot-4, 220 pound pitcher who can throw over 100 mph to a record 4 year $15 million deal. This puts an end to the summer long saga of whether the Nationals would fail to sign their first round drat pick for 2 years in a row. Of course if you had been listening to "Juicy" Jeff on the D.C. Sports Guys Show this comes as no surprise. "Juicy" has declared for weeks that there was no way in world this deal was ever going to be made before 11:59pm Monday night. Brian will be at the Nationals game tonight and will have a more detailed update on just what this means for the Nats and their Fans.